The Explosion on the MAINE! 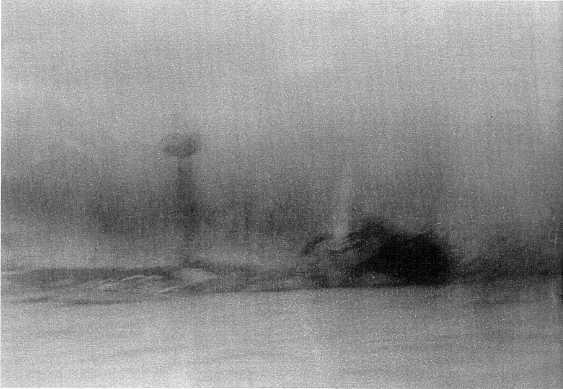 This very vague image may very well be the only view of the USS MAINE as she actually exploded or very shortly thereafter. If true, this view, recently uncovered in Spain, is one of the most remarkable photos in history. The image is quite vague. We are awaiting more information on it interpretation for our esteemed colleague, Jose Poncet. The portion to the right appears to be the bow of the vessel, bent, and exploding, possibly with flashes of flame still visible. The foremast may possibly still be seen. The stern is to the left, with the mainmast visible. She appears to be already settling into the muddy harbor bottom, but still has some distance to go. "CARLOS GOÑI was a non-commissioned officer working for the Spanish Military Administration and an amateur photographer. He always was carrying his Kodak that he had bought a few days before he was assigned to the colonial service as a volunteer. On 15 February 1898, the day after his arrival in La Habana, he was walking along the pier when suddenly a tremendous explosion and a blinding flash tore the shadows of the night. It was 9.40 PM when the USS Maine was destroyed. Carlos Goñi would use his camera at the same time that other explosion happened. Goñi got a unique testimony that has been sleeping during 100 years inside his family album, together with the rest of the images that reflect his life during a key moment for Spain's History." Carlos Goñi was an army officer whose job consisted of heading a group of military bakers. He took many photos during the war. Many showed the Spanish soldiers returning to Spain at the conclusion of the war. Compare this image to the one below, taken by Carlos Goñi the following day. 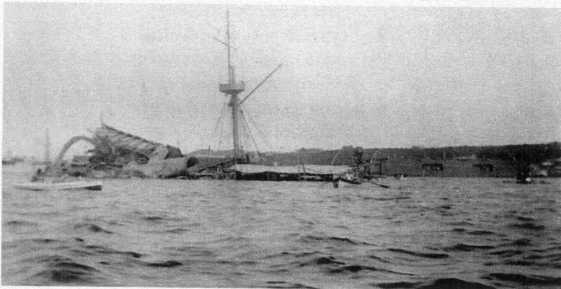 This image was taken from the opposite side of the wreck (so the vessel is facing the opposite direction). Land can be seen behind the vessel, from where the photo above was taken.